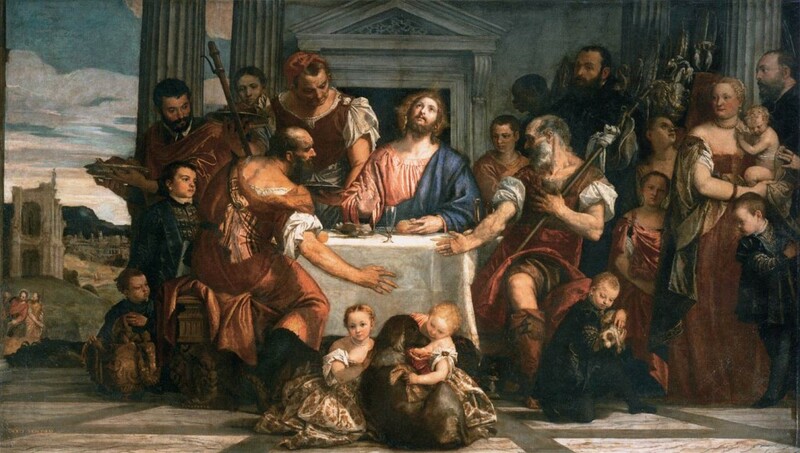 Art experts are accusing the Louvre museum of having badly botched the restoration of Veronese’s Supper at Emmaus, giving a key female figure not one but two hideous nose jobs. The first time they made the classic mistake you see so often in cosmetic surgeries today: turning an unusual down-turned nose tip into a pert, straight, little button nose with ultra-thin nostrils. The second time they tried to repair the repair and the result is a weird, wide-nostriled nose which somehow manages to look both flattened and bulbous. The lips have suffered too. They went from thin to bow-shaped to pouty. Figure 1 is the original face of the mother in Supper at Emmaus. She has a lovely character-filled nose with a gentle bump, a down-turned tip, a slender upper lip and a full bottom one. 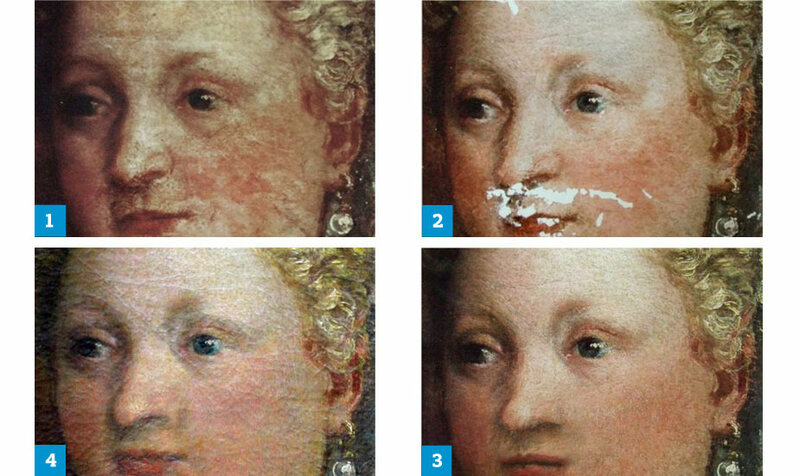 In figure 2 the “repaints”, additions thought to have been made over the centuries by past restorers, have been removed. In figure 3, you see the first nose job with its button nose and completely different upper lip. Finally figure 4 is how the painting looks now, with its down-turned again but sharper nose tip, misshapen nostrils, amorphously swollen lips and disappeared filtrum. He accused the restorers of unnecessarily retouching Veronese’s original and of “falsifying the whole physiognomy and expression”. More seriously, their “re-retouching”, as he put it, was a covert repainting without leaving any record of their actions in the museum’s files. Describing the attempt to correct the first restoration as a “tacit admission” of “gross errors”, Favre-Félix said that the museum has refused to acknowledge the second restoration, despite photographic evidence showing how the painting has changed. The French press went ballistic on the Louvre when they noticed the first restoration, so apparently the museum went in surreptitiously for a second round of Michael Jacksoning but without making a record of it in their own official files. Louvre officials describe the second nose job as a “bichonnée”, ie, a little “pampering”, so minor that there was no reason to add it to the painting’s dossier. Restoration watchdog group ArtWatch UK will publish an exposé of the Supper at Emmaus nose jobs in their journal this month (available only to members, I’m sad to say), just in time for the Louvre committee’s June 18th meeting to decide whether to restore Leonardo Da Vinci’s Virgin and Child with St Anne. If they do go ahead with it, ArtWatch fears that the Mona Lisa will be next, since there are tons of big money sponsors who would love to throw cash at the Louvre if it meant they would get to be associated with the masterpiece. This entry was posted on Tuesday, June 15th, 2010 at 7:25 PM	and is filed under Museums, Renaissance. You can follow any responses to this entry through the RSS 2.0 feed. You can skip to the end and leave a response. Pinging is currently not allowed. That’s freaking terrible. For the love of all things good and decent in this world don’t let any of those people near anything more valuable than a Bazooka Joe wrapper! I can’t believe what I’m seeing. It’s like someone went stupid with the Clone tool. Excellent Photoshop simile, btw. That’s exactly what it looks like. And these are supposed to be the greatest pros in the world. Now think for a minute about what else they’ve put their grubby little hands on that nobody’s noticed yet. I agree, but I am heartened by the fact that there are “restoration watchdog” groups. If only they had those for human cosmetic surgery, too. Wouldn’t that be a boon to humanity. I love bumpy noses with character; they’re a particular favorite of mine, so the tragic explosion of shaved, minute little upturned surgeried noses just breaks my heart. I just hope the restoration watchdog groups stay on the famous museums like stank on sheeit because most of us are not in a position to monitor what shenanigans they’re up to. I love bumpy noses with character; they’re a particular favorite of mine, so the tragic explosion of shaved, minute little upturned surgeried noses just breaks my heart. LOL, I knew this one was especially bothersome for you.